Geothermal energy has numerous benefits: it is renewable, local, uninterrupted and independent of weather conditions. In addition, its production has a low environmental footprint. Geothermal energy can also provide a long-term solution to transitioning from a fossil fuel economy without contributing to climate change. Geothermal energy has been utilized by humans for thousands of years. Studies have found that many of our ancestors used geothermal energy to warm, bathe in and cook. The first use of geothermal energy to produce electricity dates back to 1904 in Larderello, Italy, where Prince Piero Ginori Conti proved the viability of this technology. Today, geothermal presents vast opportunities in the renewable energy sector. Geothermal energy is produced from the heat naturally contained in the subsoil of our planet, generated by the molten nucleus of the Earth. The deeper you dig, the higher the temperatures reach. Very deep geothermal energy (5 to 10 km), with very high energy (temperature up to 300°C). The most productive sites to generate electricity from geothermal sources are often located in volcanic environments, as they provide a large amount of thermal energy. The principle of a geothermal power facility is to extract the heat contained in the ground, and either to use it in the form of heating (heat network) or to transform it into electricity. If the plant is able to produce both, it is called cogeneration. In high and very high energy systems, the steam rises with enough pressure to turn a turbine, in order to produce electricity. 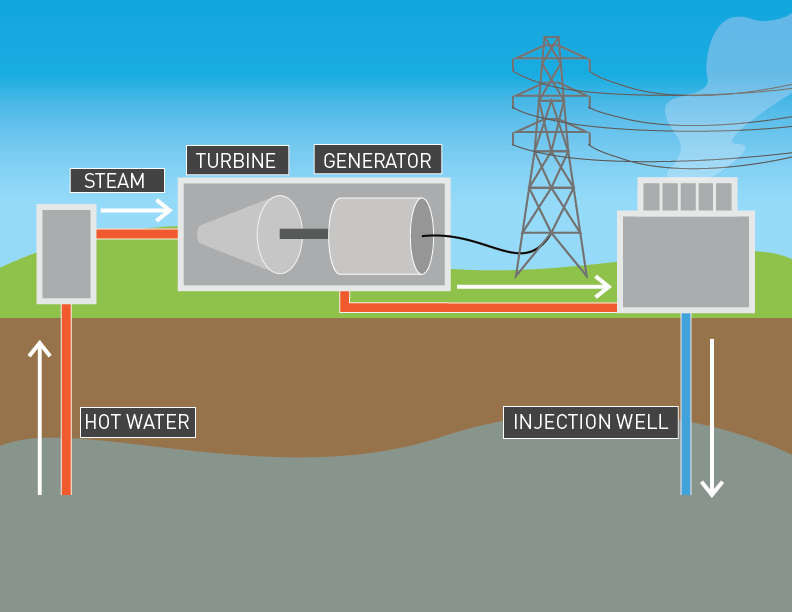 In medium energy systems, the production of electricity requires a technology using an intermediate fluid that is circulated in the bore holes, which is heated with geothermal water. This fluid is charged with thermal energy, boils and vaporizes; spinning a turbine that produces the electricity.